Search and adopt a Havanese near you. The Havanese is a breed of dog of the Bichon type. They are very playful dogs and good with older, more considerate children. They love to be on furniture and do not shed much. The Havanese, while a toy dog, is also a hearty and sturdy for such a size, and should never give the appearance of fragility or of being overly delicate. Weight range is from 10-15 pounds. The height range is from 8½ to 11½ inches, with the ideal being between 9 and 10½ inches measured at the withers, and is slightly less than the length from point of shoulder to point of buttocks, which should give the dog the appearance of being slightly longer than tall. A unique aspect of the breed is the topline, which rises slightly from withers to rump, and the gait, which is flashy but not too reaching, giving the Havanese a sprightly, agile appearance on the move. They love to play and make beautiful puppies. They are good swimmers but not the best; most don't like the water. The expression of the face with its almond eyes is very cute, and the ears, which are medium in length and well feathered, always hang down. The tail should curve over the back, and is covered with a plumb of long fur. Their coat should be brushed daily, because their fur is prone to mat.. They are the kind of dogs you would make or buy a sweater for. When you give them a bath make sure to blow dry them dry. The key word for the Havanese is "natural", and the breed standards note that except for slight clipping around the feet to allow for a circular foot appearance, they are to be shown unclipped. Further trimming, backcombing, or other fussing is against type and will cause a dog to be disqualified. That includes undocked tails, uncropped ears, and even a standard that forbids the use of topknots and bows in presentation, to keep with the traditional look of the dog, where the hair covered the eyes and protected them from the harsh Cuban sun. Although there are a few arguments on whether the original Havanese were all white or of different colors, modern Havanese are acceptable in all coat colors and patterns. The coat is long, soft light and silky. 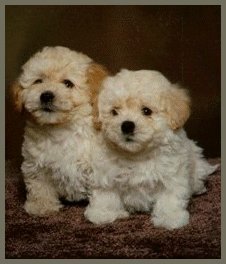 Havaneses, like other Bichons and related dogs like the Poodles, have a coat that catches hair and dander internally, and needs to be regularly brushed out. Many people consider the Havanese to be nonallergenic or hypoallergenic, but they do still release dander, which can aggravate allergies. It's best to be exposed to the Havanese before deciding to choose one as a dog for a house with allergies. The American Kennel Club standard notes "his character is essentially playful rather than decorative" and the Havanese, when shown, should reflect that, generally looking like a toy in size only, but more at home playing with children or doing silly tricks than being pampered and groomed on a silk pillow. The Havanese often appears on lists of dogs that allegedly do not shed (molt). However, such lists are misleading. Every hair in the dog coat grows from a hair follicle, which has a cycle of growing, then dying and being replaced by another follicle. When the follicle dies, the hair is shed. The length of time of the growing and shedding cycle varies by age and other factors. "There is no such thing as a nonshedding breed." Some dogs shed more than others. While you cannot say that Havanese is a nonshedding breed, you may say that Havanese shed very little. Havanese are supposed to have a slightly wavy, double coat. However, unlike other double-coated breeds, the Havanese outer coat is neither coarse nor overly dense, but rather soft and light with a slightly heavier undercoat. Not all Havanese have coats that match the standard. Havanese coats are supposed to be very soft, like unrefined silk (compared to the Maltese coat, which feels like refined silk). However, in some dogs the coat can become too silky, looking oily. On the other end of the spectrum, Havanese coats can be too harsh, giving a "frizzy" appearance. Because of the tropical nature of the Havanese, the thick coat is light and designed to act as a sunshade and cooling agent for the little dog on hot days. This means that the fluffy Havanese does need protection against cold winter days, in spite of the warm woolly look of their fur. The coat can be shown naturally brushed out, or corded, a technique, which turns the long coat into "cords" of fur, similar to what dreadlocks are in Humans. This corded look may be difficult to achieve for the first timer, so it is always recommended that someone interested in cording his or her Havanese consults someone who has done it before. The Havanese has a playful, friendly temperament, which is unlike many other toy dog breeds. It is at home with well-behaved children and most other pets, and is rarely shy or nervous around new people. Clever and active, they will often solicit attention by performing tricks, such as running back and forth between two rooms as fast as they can. They are very lovable. The Havanese is a very people oriented dog. They often have a habit of following their humans around the house, even to the bathroom, but do not tend to be overly possessive of their people, and do not usually suffer aggression or jealousy towards other dogs, other pets or other humans. Havanese have been known to eat only when they have company in the same room. If one is eating and their person leaves the room, it is likely the dog will grab a mouthful of food and follow their "person", dropping the food and consuming it one morsel at a time in the room their person goes to. Havanese are true "dogs", loving to play in an aggressive manner, not wanting to be the "loser" of whatever game they are playing. That being said, they calm down quickly when prompted to do so by their owners. Havanese have excellent noses and are easily trained to play "find it" where the owner hides a treat and the Havanese sniffs it out, never giving up until the treat is discovered. This is a highly trainable dog. Havanese are natural companion dogs: gentle and responsive. They become very attached to their human families and are excellent with children. Very affectionate and playful with a high degree of intelligence, these cheerful little dogs are very sociable and will get along with everyone including people, dogs, cats and other pets. They are easy to obedience train and get along well with other dogs. This curious dog loves to sit up high on a chair to observe what is going on. It is very sensitive to the tone of your voice. Harsh words will only upset the dog and will achieve very little. Generally, harsh punishment is unnecessary. The Havanese have a long reputation of being circus dogs, probably because it learns quickly and enjoys doing things for people. The Fédération Cynologique Internationale standard notes that "he is easy to train as alarm dog." It is best to teach them not to bark unnecessarily while they are still young to prevent it from becoming a habit. Havanese can be good alarm dogs - making sure to alert you when a visitor arrives, but quick to welcome the guest once it sees you welcome them. Some dogs may exhibit a degree of shyness around strangers, but this is not characteristic of the breed. They are very attracted to people and will not serve as a guard dog.